A review of standard pallet dimensions, why standard sizes are important in supply chain operations, and a list of pallet standards resources. 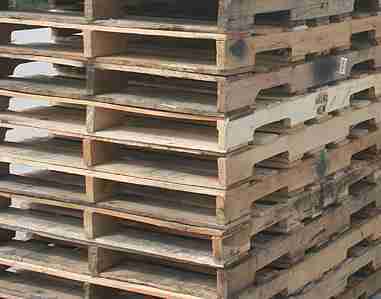 There are a number of standard sizes for pallets being used in the United States and internationally. They vary between countries, as well as between industries. This article lists standard size information for applications in North America, Europe, Australia and Asia. Sizes are presented in inches as well as centimeters for wooden pallets as well as plastic, composite and pallets made from other materials. For many logistics and supply chain professionals, their typical pallet size or sizes often are well established and taken for granted, unless there is a need to revisit them. A different pallet size may be required, for example, to meet the needs of a new customer, new retail format, or perhaps to optimize newly installed warehouse automation. The operational and sales benefits offered by half pallets or quarter pallets, for instance, are currently motivating some companies to revisit their approach to pallet size. I’ll talk about these opportunities later in this article. When people think about the standard dimensions in North America, they rightfully think of the 48×40-inch pallet (1219×1016-mm) pallet, which became popular in the 1960s. The 48×40-inch pallet is one of six ISO standard pallet dimensions (see below). The notched stringer GMA-style pallet has long been the unofficial “standard” for fast moving consumer good (FMCG) supply chains, although there has been considerable variation in such pallets for decades regarding component thickness and width, lumber grade, wood species, fasteners, repair techniques and allowable damage tolerance. Because of such variability, it is important to communicate detailed pallet expectations to pallet suppliers or inbound shippers. GMA pallets are sold both as new or used (recycled). Click here to find out more about recycled pallet grades. 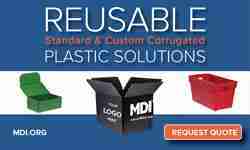 Click here to find out more about remanufactured pallets. 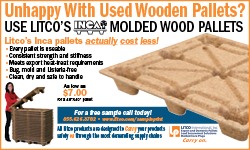 The 48×40-inch block pallet began to also establish a presence in FMCG supply chains in the latter 1990s and the early 2000s, thanks to pallet rental providers CHEP and subsequently, PECO, making them readily available to pallet users in the U.S. (Block pallets were already popular at that time in other supply chains, as well as in Europe.) One question that comes up has to do with CHEP pallet dimensions. In North America, the CHEP standard size is 48×40-inch. More recently, the 24×40-inch half pallet was introduced. There is also a CHEP 48×20-inch pallet offered in Canada. Internationally, CHEP pallet dimensions typically conform to existing or emerging standards in the region of use. Standard pallet size in inches and millimeters. Pallet converting 1000mm to inches: 1000mm =39.37 inches. Six pallet sizes are sanctioned by the International Organization for Standardization (ISO) as presented in ISO Standard 6780: Flat pallets for intercontinental materials handling—Principal dimensions and tolerances. Why Are Standard Pallets Important? Standard pallet sizes can be important in enhancing supply chain efficiency and flexibility, for example, where various links in the supply chain and material handling equipment are optimized for handling the standard size. Truck utilization, warehouse storage utilization and even retail placement as well as the interface with forklifts and other material handling equipment can all be better optimized through the standard size. 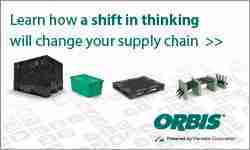 Flexibility comes into play regarding ease of engaging alternate supply chain partners, where all concerned make use of the standard pallet. Regarding pallet supply, the use of standard pallets such as GMA pallets or EPAL pallets allows for scale and competition. As a result, pallet users often enjoy competitive pricing. Likewise, used standard pallets are typically in high demand, so pallet recyclers are motivated to recover and refurbish them for resale. Standard pallet usage promotes recovery and reuse. On the other hand, where accepted pallet sizes become institutionalized and supply chains are optimized to handle them, there may be resistance to innovations that diverge from the standard.